VenoStent has developed a solution to help reduce venous access site failures for hemodialysis patients. Using shape memory polymer technology, our slowly bioresorbable SelfWrap provides a self-closing, durable, flexible, mechanical support system that is customizable at the point of surgery. This means surgeons can add the wrap during the access surgery procedure with next-to-no increase in time. 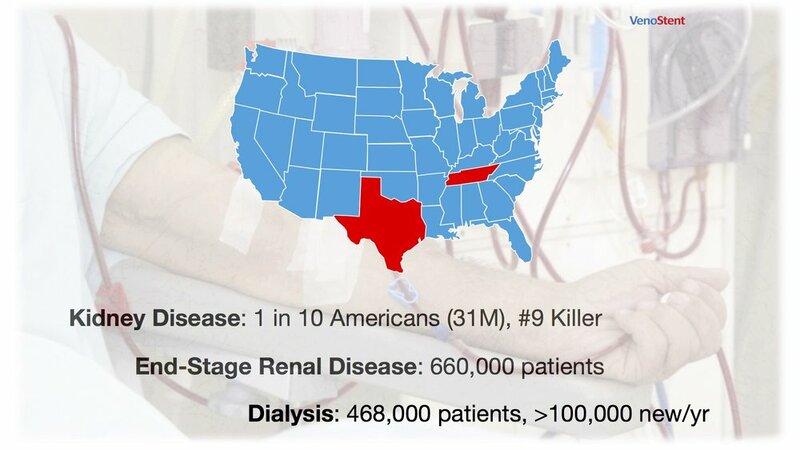 The number of people in the United States with End-Stage Renal Disease is roughly equal to the size of Texas and Tennessee, combined. Those who have to undergo hemodialysis each year is enough to fill the entire city of Boston, Mass. For the nearly half million Americans who spend three to six days per week, four hours per session, in a dialysis clinic, there are currently no solutions to reduce dialysis access site failures. We strive to fix this.